Original Content: Time Management Tuesday: Can Our Environment Impact How We Use Time? Time Management Tuesday: Can Our Environment Impact How We Use Time? Earth Day is coming up on April 22, and I'll be observing it off and on all month. Yeah. Earth Day Month. Today I'll begin by stretching the meaning of environment and pondering whether our immediate environment, and lack of order within it, can have an impact on how we use time. First off, I'd argue that without a doubt lack of order in our immediate environment will be a time buster just because it makes it difficult for us to keep track of things. Time gets sucked up hunting for things in the office or even going out to buy more of what we can't find. That's a practical matter. But last month in a Chicago Tribune article, Self-control, Smells, and Spending, Gregory Karp wrote about some recent studies that concluded that our immediate environment has a less obvious impact, as well. The studies, he says, indicate that a "disorganized environment can leave you feeling out of control, which drains your reserves for future self-control, leading to poor decisions including impulse spending." What does impulse spending have to do with time management? It's not the spending we should be concerned with, it's the draining self-control or discipline. If a disorganized environment makes people feel out of control enough to impulse shop, won't it make us feel out of control enough to shake up our work schedules? In fact, according to ScienceDaily, the researchers on one of the studies Karp refers to, Environmental Disorder Leads to Self-Regulatory Failure, were "looking for changes in behavior like impulse spending as well as poor mental performance or reduced stamina on tasks that require advanced thinking skills." "Reduced stamina on tasks that require advanced thinking skills"--that's what we're concerned with. Environmental Disorder (Boyoun (Grace) Chae of the University of British Columbia and Rui (Juliet) Zhu of the Cheung Kong Graduate School of Business in China) is quoted all over the Internet. 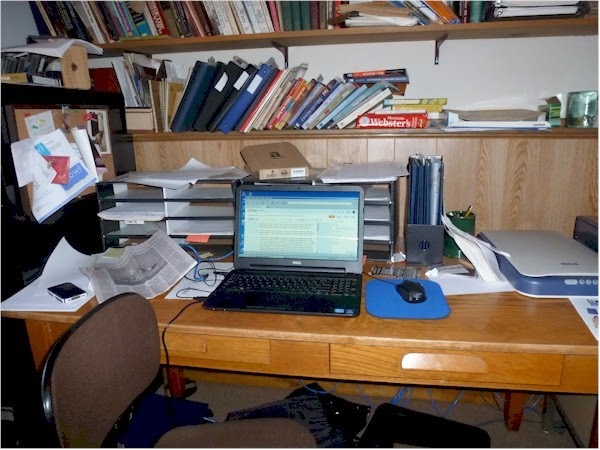 A blog at The Harvard Business Review picked up this point in the study: "...people who sat by a messy desk that was scattered with papers felt more frustrated and weary and took nearly 10% longer to answer questions in a color-and-word-matching task, in comparison with those who were seated by a neatly arranged desk." 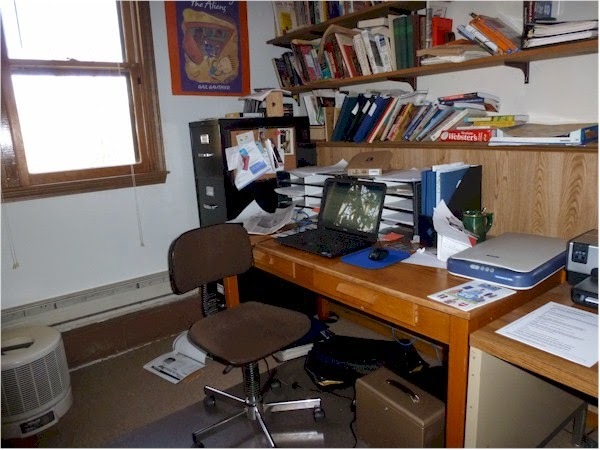 Another issue relating to disorder in our immediate environment is that many writers work in their homes. How "immediate" does "immediate work environment" mean in that case? Not many of us have someone coming in to do laundry or clean bathrooms or...Well, anyone who works at home in any way knows where I'm going with this. "...disorganized environment can leave you feeling out of control, which drains your reserves for future self-control." Everyone's tolerance for disorder is different, but I will admit that sometimes having to walk through my kitchen on my way to the office drains my reserves. I'd also like to point out that over the last few decades the value of homemaking has taken a few hits. Letting housework go and not being a perfectionist about it are the center pieces of many articles on how to manage time and stress. How often is the traditional suburban housewife some kind of heavy/bad guy on TV shows or at least a laughable cliche? (Not Alison on Orphan Black, by the way. I love her.) And, yet, without the order they once maintained many of us find ourselves in a disorganized environment that often drains our reserves of self-control. Well, I've used up a couple of units of time writing this blog post, and now I need to use my break to fold the towels I washed yesterday. They're up in my living room. Talk about disorder.